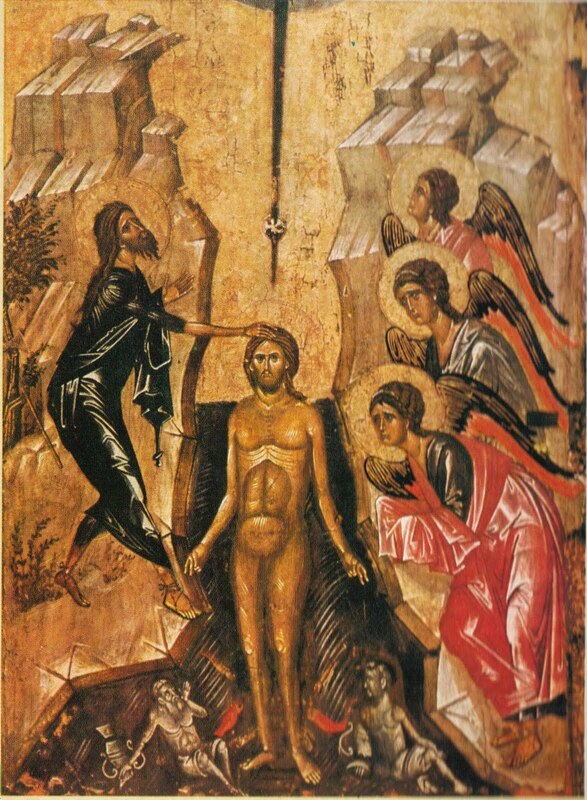 Today the entire Orthodox Church universal celebrates the festive remembrance and glorification of the Baptism of the Lord Jesus Christ by John the Baptist in the River Jordan. The holy Evangelist reports that when the Lord came to the Jordan to be baptized, John attempted to restrain Him, saying: "I must needs be baptized of Thee, and dost Thou, then, come to me?" Would not we say the like, knowing Who this is Who has come: Lord, what doth it signify, this extreme humility of Thine, that Thou, the Lord Who is without sin, comest to be baptized of a man, even if he be one who is righteous through Thine own grace and righteousness? What is there to wash away in Thee, Who art more pure than the sun; or to enlighten in Thee, the Sun of Righteousness? -- But is it for us sinful and short-sighted ones, deprived of far-sightedness, to gainsay the Lord Himself, Who created all things and Who wisely does much that is beyond word and reason? All the words spoken by the Lord Jesus Christ, and all His actions, bear within themselves the seal of the supreme wisdom and righteousness of God, so incomprehensible to the proud scholars of this age, who dare to equate the Very Lord of Glory Himself to ordinary men, and who interpret His words in accordance with the understanding of their perverted and lost minds; -- and we must humbly bow ourselves down before Him with perfect trust and with profound reflection, beseeching the gift of unnderstanding from God. Hence, the aforesaid words of the Lord to John that he baptize Him silently, and without gainsaying Him, -- and the very act of baptism at John's hand -- likewise bear upon themselves the seal of the most-supreme wisdom, goodness, and righteousness of God. "Let it be, for now," says the Lord, "for thus doth it behoove us to fulfill all righteousness;" i.e., it is for this reason that I came to earth and became man, while abiding ever as God, -- the Lord says, as it were -- in order to fulfill all Divine righteousness, which was so brazenly trampled down in paradise by the first-created humans and, later, -- the further one penetrates into the depths of time and of the generations of man -- even more audaciously, more wickedly, more evilly, more profanely, was trampled down by all mankind, with the exception of a few chosen ones. I come to take upon Myself all the iniquities and impurities of humanity, without being defiled by them, in order to make payment for them, thereby satisfying the justice of My Father in heaven, and to offer Myself as a redemptive Sacrifice, in order to immerse them all in the waters of the Jordan. I Myself, having fulfilled all righteousness, desire to teach people Divine righteousness, giving them the power and the grace to fulfill it. That is the significance of the Lord's words to John: "Let it be, for now, for thus doth it behoove us to fulfill all righteousness." Generally speaking, in the course of reading or hearing the Lord's words, or His Gospel concerning His acts, we must not let it slip from our purview that He is the Lamb of God, Who taketh upon Himself the sins of all the world, and the Redeemer of the human race; the High Priest after the Order of Melchizedek, Who offered Himself as a Sacrifice of reconciliation to His Father in Heaven, on behalf of us sinners, -- that He is the Righteous Judge of all, the Physician of all those languishing in sin, and the Warrior Who has gone out to engage in spiritual single-combat that spiritual Goliath -- the devil -- who, with supreme artifice, cunning and perseverance, did subjugate, and continues to subjugate, the entire human race by means of innumerable passions and vileness of all sorts, and whom the Lord, through divinely-wise, righteous forethought, has vanquished completely, delivering mankind from his [the devil's] power. Thus was the Lord also baptized in the River Jordan, in order to subdue our destroyer, the devil, in the waters wherein he had his haunt, and to leave the waters such, that we, in being baptized therein through triple immersion in the Name of the Holy Trinity, might be abundantly washed clean of the filth of the ancestral sin, and that we might be born again into a new life, through water and the Holy Spirit, and might become adopted [sons and daughters] of the Father in Heaven, by living a holy life. The circumstances of the very Nativity of the God-man likewise bear the seal of the most-profound wisdom and righteousness of God. He was born of a poor Virgin, Most-pure, and was placed in a manger, wrapt in swaddling-cloths, like an infant, in order that through His humility He might make restitution for the pride of Adam and Eve, who aspired to be gods, in order to convict and mortify human pride, and to teach men humility, which is the foundation of all virtue. All that the Lord spake and did on earth, He did in accordance with the pre-eternal, most-wise, and all-good Counsel of the Trinity, which transpired before all ages, all of which was necessary for the salvation, perfection and blessedness of mankind; and, if any rejected, and continues to reject, His commandments, counsels, statutes, and that Church which He founded on earth, the same was, and is, the enemy of God and of himself, having thus rejected the Divine Counsel concerning himself. Baptism was ordained by God in the Church for the salvation of the human race, -- and it is necessary for every believer as a door into the Kingdom of God, -- and whosoever rejected or rejects it, the same sweeps away his salvation, his own eternal well-being. In this manner did the Lord speak of the Pharisees and the Scribes, who were undesirous of being baptized by John; that they were thus spurning the Counsel of God, concerning themselves, in not being baptized by him. Beloved brothers and sisters! We all have been found worthy of holy Baptism in our infancy, through the faith of our parents and our sponsors; we were cleansed of the ancestral sin and were reborn of water and the Holy Spirit, and -- became the adopted children of the Father in Heaven. The doors of the Kingdom of Heaven stand open to us. Let us, then, with all our hearts, always esteem the Divine gift and our calling as sons and daughters of God by grace, -- withdrawing far from all sin, and let us, in our thoughts, desires, and actions, strive for the Kingdom of Heaven, that inccorruptible, unfading inheritance, prepared for us in the heavens. Amen. Source: Translated into English by G. Spruksts, from the Russian text of "Krescheniye Gospodnye" ["The Baptism Of the Lord"].